The initial idea was to develop a traditional sports gear and give it a completely new touch. It was important for us to pay a lot of attention to the emotional components when doing sports and bring them into the design process. 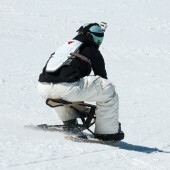 Sledging seemed to be a field with a lot of potential; trying to combine it with the inspirations from downhill biking, motorbiking and skiing opened up a completely new world. 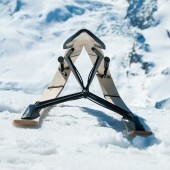 Aroc is a racing sledge with a tiltable body and waisted runners, which allows the user to make carved and slided turns on the slope. The design makes its usage very convenient, since the feet can always rest on their place and the agility of the construction makes steering easy and safe. The special position and the uniqueness of the steering process create an unexpected feeling while riding, quite much like on a motorbike. Operating the sledge is as intuitive as it can get; to tilt the runners, the rider just leans into the curve like on a bike. The construction offers responsive and smooth maneuverability as well as natural shock absorption when seating completely. There's a handbreak on each side for better balance control in the curves and over the speed in general. 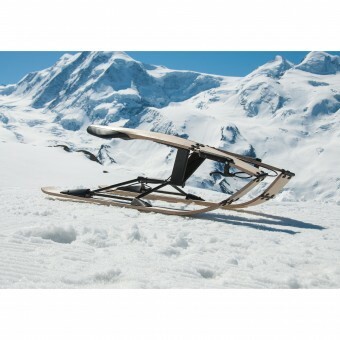 There's no need to put the feet into the snow while riding, they can rest safely on the runners, enabling higher speeds and reducing aching knees. The project started in February 2014 and finished in June 2014 in Aarau. It was exhibited in the annual exhibition of the Institute Industrial Design. The current design was realized mostly with moulded wood and a welded steel frame. Both materials offer good stability and easy processability. The frame could be realized entirely with standardized pipes. Very helpful was the bottom-up method, always trying to combine function and look in an ideal manner through experiment and function studies. Mockup-models provided important experience about materialistic requirements and dynamic behaviour. The main goal was to find a new way of sledging not only on the technical side, but also speaking of emotion and feeling. Of course, a lot of research was done investigating the field, but the biggest developments took place at the functioning models themselves. Testing the sledge on the slopes in Zermatt CH offered important findings concerning the ergonomy, controllability, influence of the snow characteristics as well as problems with the infrastructure. Most challenging was to find a design which isn't overcrowded and too complex due to the many features of the concept. We wanted to keep the look simple and not too technical, but at the same time the construction needed a lot of adjusted details to actually work. Another difficulty were all the questions concerning the adaption in existing infrastructure, transport and material. Mostly thanks to the tests we could identify and eventually find reasonable solutions to them. Aroc Racing Sledge by Kessler, Perren & Aeschbacher is a Nominee in Sports, Entertainment and Recreation Equipment Design Category. · Click here to register today inorder to be able to view the profile and other works by Kessler, Perren & Aeschbacher when results are announced. Aroc Racing Sledge by Kessler, Perren & Aeschbacher is Winner in Sports, Entertainment and Recreation Equipment Design Category, 2014 - 2015. · Press Members: Login or Register to request an exclusive interview with Kessler, Perren & Aeschbacher. · Click here to register inorder to view the profile and other works by Kessler, Perren & Aeschbacher. Did you like Kessler, Perren & Aeschbacher's Sports Equipment Design? Did you like Aroc Racing Sledge? Help us create a global awareness for good sports equipment design worldwide. Show your support for Kessler, Perren & Aeschbacher, the creator of great sports equipment design by gifting them a nomination ticket so that we could promote more of their great sports equipment designs.